A device used to measure atmospheric pressure. 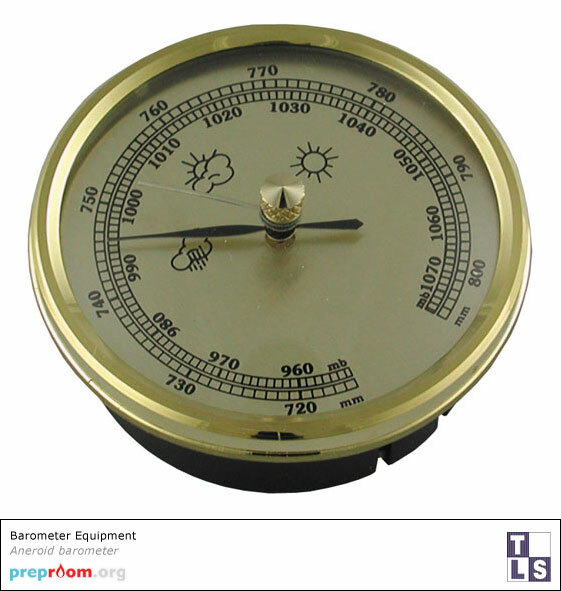 A barometer is a device which accurately measures the pressure exerted by the atmosphere. They can therefore be used to predict changes in the weather associated with these changes in pressure. 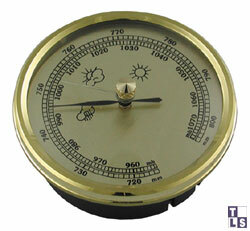 Two main types of barometer are generally used; mercury and aneroid. In traditional barometers, a reservoir of mercury is used to measure the atmospheric pressure. The level of mercury in a tube moves in direct relation to the pressure exerted upon the reservoir it is connected to. The tube is often graduated so that the relative pressure value can be easily read. The density of the mercury may change significantly with temperature, so a reading must be adjusted for the temperature of the instrument. Some instruments take this into account while others also include a mercury thermometer so that these adjustments can be made accordingly. With aneroid barometers, a small, flexible metal box called an aneroid cell is used. This cell is made from a beryllium and copper alloy. This cell flexes with changes in atmospheric pressures, causing it to expand or contract. This small movement is amplified by a series of levers and springs so that a value can be read from a moving hand, much like those used on clock faces. Most aneroid barometers also feature a static hand which can be set by the operator, enabling the difference in pressure over time to be seen at a glance. Traditionally barometers have been used to observe and predict weather patterns that are characterised by changes in pressure. High air pressure indicates fair weather while low pressure indicates that storms are more likely to occur. The contents of this page are for information only. Please refer to CLEAPSS or ASE safety advice and/or publications before undertaking any preparation, practical experiment or using any equipment featured on this site or any other.